We are a leading Manufacturer and exporter of oxygen plants, oxygen & nitrogen gas plant with cylinder filling station, oxygen production plant, cylinder filling oxygen gas plant, industrial & medical oxygen and nitrogen gas plant. DCPL specializes in manufacturing and fabricating oxygen generating plant that function at low pressure process of 6 to 8 bar using the advanced air compressors. Our oxygen production plants are reputed for producing oxygen having bone dry quality with purity up to 99.7%, which is considered excellent for both medical and industrial applications. Our oxygen production plant is a solidly constructed plant incorporating outstanding features such as low power consumption, sturdy design and easy to operate. Our oxygen machinery is used in wide range of industries including steel industry, health industry, metal production industry, aviation industry, and glass and ceramics industry. We offer industrial oxygen systems in different capacities ranging from 20m3/hour to 500m3/hour. We use the latest cryogenic technology in the fabricating of our machinery. DCPL has got an in-house R D unit that is engaged in manufacturing and fabricating oxygen production plant. Our highly skilled workforce is continually innovating and fabricates oxygen generating plants that are globally competitive in terms of performance and prices. Fabricating and manufacturing is done in compliance with international standards and are sold all over the world. Our oxygen plant for cylinder filling is fabricated as per EIGA (European Industrial Gas Association) standards. For strict compliance with quality control measures, we have been given ISO 9001:2008 and CE certifications. We manufacture oxygen generating and cylinder filling plants that skid mounted requiring little time for installation. Fabricated using 100% cryogenic grade stainless steel, our oxygen gas manufacturing plants produce 100% medical oxygen meeting European Pharmacopeia. We are instrumental in offering our clients a high quality range of Oxygen Plant. The offered plant is meticulously tested on various quality parameters and is widely demanded for manufacturing fly ash brick. This plant is manufactured by utilizing optimum quality components and latest technology. In line with industry quality standard, we provide the entire range in various technical specifications and at affordable prices. DCPL is a leading oxygen plant manufacturer of oxygen production plant, oxygen plant for cylinder filling, oxygen generating plant and oxygen manufacturing gas plants. Our company ensures that the plant machinery is reliable and durable meeting the various requirements of customers engaged in different industries. Our oxygen production plant finds applications in industries such as glass industry, pharmaceutical and medical industries, and petroleum industry and oil refinery. Our oxygen plant machinery comes in various capacities ranging from 20m3/hour to 500m3/hour. We use the latest technology and employ the best materials in the fabricating of the machinery. Oxygen generated in our machinery has no contaminants since oxygen gas /liquid is processed at cryogenic temperatures. DCPL imports the cutting-edge technology for manufacturing oxygen production plant that uses stainless steel column. Manufacturing of oxygen plant for cylinder filling is finished as per EIGA (European Industrial Gas Association) standards. Our oxygen machines have been given ISO 9001:2008 and CE certifications. Fabricating is completed incorporating the best materials and the latest technology to generate oxygen with purity up to 99.7%. Our oxygen generating plants are completely skid mounted requiring very little time for installation. Our plant ASU column is manufactured with 100% cryogenic grade stainless steel. Components used in our machinery are as per the standards of American Society for Mechanical Engineers (ASME). As our plant machinery is fabricated with 100%cryogenic grade stainless steel, it is able to produce medical grade oxygen that meet European Pharmacopeia. 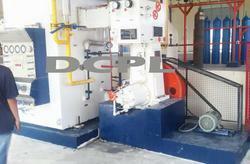 DCPL is a known for manufacturing, fabricating and supply oxygen plant for cylinder filling. We build oxygen machines that are solid and reliable fulfilling the needs of our customers. Advanced technology is used in the fabricating of our oxygen production plant to ensure that it is globally competitive. Oxygen generating plant is used in numerous industries including pharmaceutical and biotechnology, metallurgy, glass and ceramics industry. We manufacture plant machinery in different capacities ranging from 20m3/hour to 500m3/hour. The most cutting-edge cryogenic technology is used in the fabricating to ensure that machinery generates 99.7% pure oxygen. Oxygen produced in our plant machinery contains no contaminants since oxygen gas /liquid is processed at cryogenic temperatures. DCPL uses technology which is bought from the best European oxygen gas manufacturing companies. Best quality material is used in the fabricating of the machinery. We use stainless steel column in the manufacturing of oxygen generation plants. Construction of oxygen plant for cylinder filling is completed as per EIGA (European Industrial Gas Association) standards. For compliance with quality control measures, DCPL has been awarded ISO 9001:2008 and CE certifications. As our plant machinery is skid mounted, it can be quickly installed. Air separation unit (ASU) column is completely fabricated with 100% cryogenic grade stainless steel. Materials used in the fabrication of our oxygen production plants comply with the standards of American Society for Mechanical Engineers (ASME). Our plant machinery can generate oxygen that meets the standards of Indian and European Pharmacopeia. We are regarded as leading industrial gas plant manufacturing company and deliver oxygen manufacturer plant for delivering high purity oxygen. We offer the best oxygen and nitrogen plant set up cost besides you get the best oxygen plant price with on buying from us. High quality raw materials are used in the manufacturing of the oxygen plants and nitrogen plants. Technology used in the machinery is got from the reputed industrial gas manufacturing company in Europe. High grade stainless steel is used in the manufacturing of oxygen production plant. Our oxygen manufacturer plant is famous for delivering seamless performance besides being reliable and durable. Our oxygen gas plants come in different sizes and capacities ranging from 20m3/hour to 1000m3/hour. High quality materials are used in fabricating and manufacturing of oxygen machinery. Our set up cost of oxygen and nitrogen gas plant is best in the industry and our clients will get the full value of the money they spend on our oxygen plant sale. Our oxygen machines generate oxygen with purity up to 99.7%.